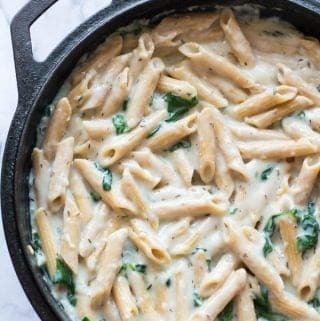 Vegan spinach pasta recipe can be made in a single pan where the coconut milk is the main ingredient for the Alfredo sauce. 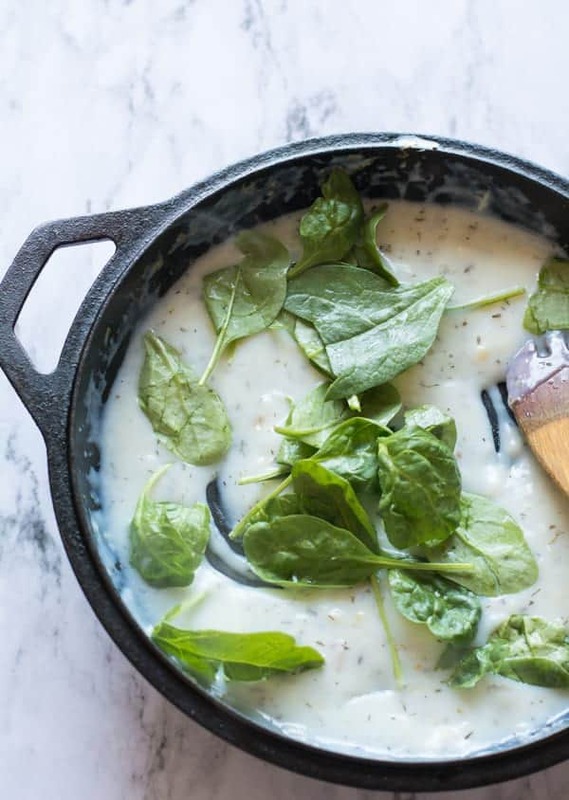 This recipe has a rich, creamy gravy with garlic and spinach. 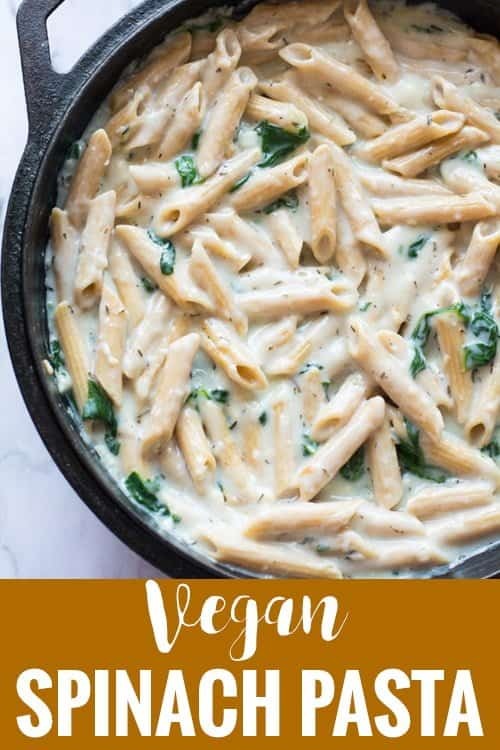 Vegan alfredo spinach pasta recipe it is all in one pan, not to mention it is perfect for the everyday simple vegan meal. Finding a vegan recipe for every day mean is really it the tougher problem.. but substituting the cheese with coconut milk is a better way to make to make it more flavorful. There are multiple vegan substitutes available for alfredo sauce. 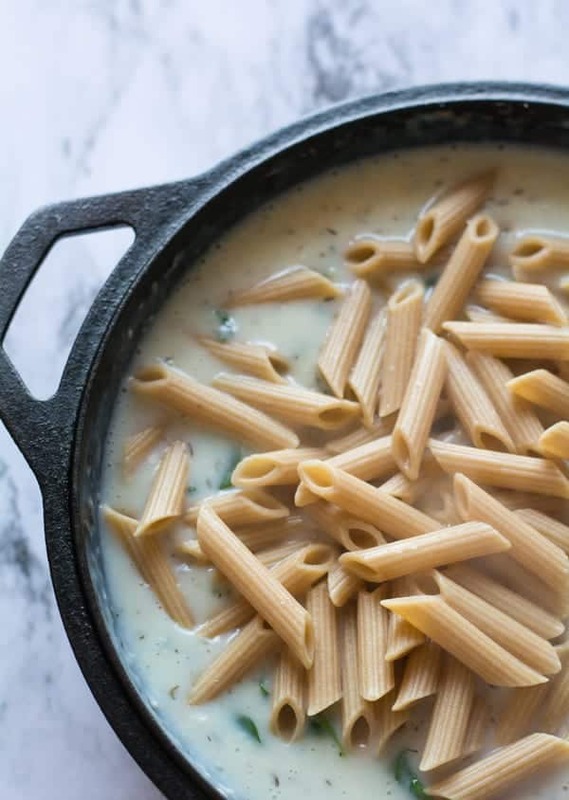 And this coconut milk-based alfredo sauce is a great source of good cholesterol. And to emphasize, coconut milk in is one of those ingredients that our ancestors were enjoying for its goodness and flavor. And it’s not being replaced till now with any other equivalent ingredient. Yes, this has been a culturally bonded to us. 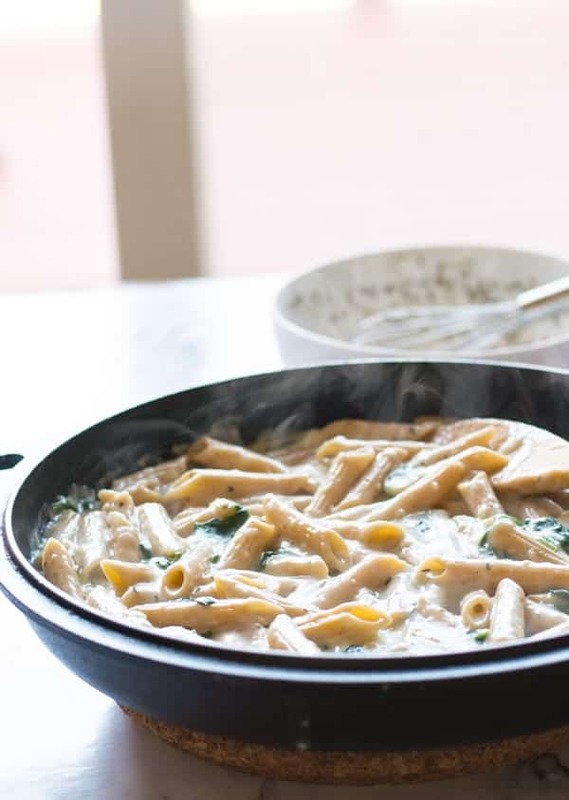 Plus, this is super impressive to tell your guests that this creamy rich pasta is made in the healthy vegan way. And this vegan dinner can be made in minutes without any fuzz or mess. For the variation add roasted vegetables and you covered the main dish in your dinner party. If you are searching for other vegan pasta recipes, do click these and find your favorite. Avocado pasta, Carrot shell pasta, pumpkin sauce pasta, Chickpea and Olive pasta. This pasta recipe is good to make with any type of pasta like fettucini, bow and tie etc. I have added baby spinach. If you are adding regular spinach, chop them randomly before adding to the dish. Add the roasted vegetable for more nutrition and colorful look. Add steamed vegetables like broccoli, cauliflower, green bean, snow peas etc. These not only add color and nutrition but also great crunchy texture. This recipe is great for the crowd. And when you are planning for the crowd, the sauce and the pasta can be made ahead. And toss them in garlic and spinach just before serving. You may also add other herbs like basil, oregano for variations for this vegan spinach pasta recipe. Vegan spinach pasta recipe, a perfect healthy dinner. The sauce is creamy and made with Coconut milk and garlic. Best comfort food for the whole family. Cook pasta as per the package's instruction. 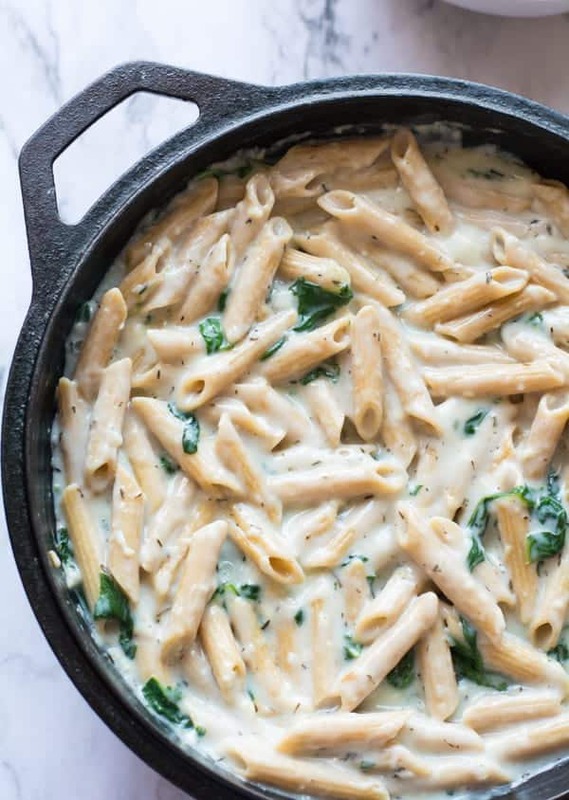 In a heavy bottomed pan, add coconut milk pasta sauce, spinach and pasta. Cook until all the ingredients blended well with each other. Serve hot Vegan spinach pasta with roasted vegetables. This pasta is made with Coconut milk pasta sauce, detailed instructions are there for your reference. Don’t want to miss a good recipe like vegan spinach pasta recipe? Sign up for the FREE 15 minute Recipes and latest recipes delivered to your inbox! Stay in touch with me on Facebook, Pinterest, Instagram for all the latest recipes. Thanks for the post, it’s pinned and will be made soon. Loved your idea. Addition of butternut squash and green peas would be tastier and appetitive. I loved this dish very fun making and very enjoyable.